Health care costs continue to be top of mind for a plurality of voters, according to a recent poll by PPI and Expedition Strategies. Our poll surveyed 1,090 likely voters on to gather data to apply context and to for what kind of agenda progressives should craft as the 2020 election cycle dawns. Health care handily outweighed other issues overall and was the one issue where there was agreement across party lines in its importance. In the midterms, this was most clear in states like Arizona where Senator-elect Kyrsten Sinema essentially ran a one issue campaign – protecting those with preexisting conditions – and beat out Republican Martha McSally. Her messaging resonated with voters who were afraid of losing affordable coverage because of preexisting conditions. Among respondents of our poll, 45 percent ranked health care as one of their top three concerns, including 55 percent of Democrats, 42 percent of Independents and 38 percent of Republicans. The results showed that there is anxiety around health care costs. 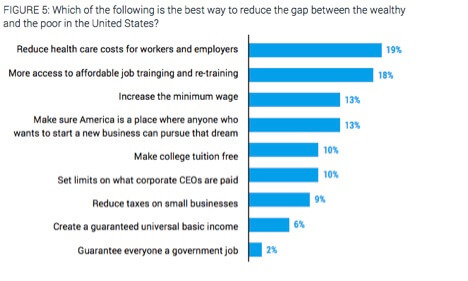 When asked about the best way to reduce the gap between the wealthy and poor in the United States, 19 percent of respondents cited reducing health care costs as a possible policy lever. The Affordable Care Act (ACA) was a market-based solution that focused on getting more Americans covered. And in that regard, it did succeed. The uninsured rate among the non-elderly population has dropped from 18.2 percent in 2010, to 10.3 percent in 2018. That being said, costs are still a driving factor for why so many remain uninsured or why even those with coverage struggle to afford their co-pays and co-insurance. In 2016, of those who said they were uninsured, 45 percent cited cost as the driving reason. Additionally, one in four Americans taking prescription drugs reports difficulty affording their medications. Though overall drug spending only accounts for roughly 10-13 percent of total health care spending, it is the fastest growing sector. This may explain why drug companies find themselves out of favor with voters. When asked how they would rate industries, drug companies came in lower than oil companies. It’s clear that the uncertainty stemming from GOP sabotage of the ACA contributes to voter anxiety over pre-existing conditions, drug costs, and out of pocket costs. The concern over cost could explain why there is significant public interest in nationalized health care and Medicare-for-all. By a margin of 54 percent to 46 percent, voters said they favor a system in which “everyone gets health care through Medicare instead of through people’s place of work or instead of buying it directly,” with even 47 percent of Republicans favoring such a universal program, according to the poll. Health care is a top concern among women in particular. Women reported being very worried that drug companies are charging too much and were twice as worried as men about their ability to pay health care bills. The big question for Dems is, having won the 2018 midterm in significant part on defending ACA, what should Dems do next on health care? Our poll suggests voters want action to stabilize markets, protect people with preexisting conditions and keep premiums down. Though many reported supporting Medicare-for-all, our poll also shows that people don’t want big tax increases. Additionally, Kaiser Family Foundation polling has found that when informed about the tradeoffs of greater government involvement (i.e. higher taxes) some of the support for Medicare-for-all wanes. As PPI has documented, there are many roads to universal and affordable health care. As the 2020 presidential cycle gets underway, there should be a robust debate about the best way for Dems to build on the ACA’s successes. Overall, the poll suggested that a progressive, yet pragmatic, agenda could help Democrats sustain a governing majority. Voters clearly favor individual initiative and self-determination even if they favor a larger government role in health care specifically. Democrats need to maintain and expand this near-majority advantage going into 2020. And to do that, they must craft a broadly appealing agenda that brings in and keeps independents and less committed partisans—the majority of whom call themselves ‘moderate’—under the tent.